The Witches: A Discworld Game is the second of three games by Martin Wallace set in Terry Pratchett's Discworld, the first being Discworld: Ankh-Morpork. The Witches is set in the magically charged land of Lancre. Players take on the role of trainee witches, such as Tiffany Aching and Petulia Gristle, learning their craft and dealing with all the problems, both petty and serious, that life on Discworld can throw at them. A subtle blend of headology, magic and, of course, the all-important cup of tea will see our heroines tackle everything from a sick pig to a full-blown invasion of elves. Each player tries to be better at everything than the others, while also cooperating to prevent crises from escalating. Life can be tough for a young witch in Lancre. Fear not, however, as some of Terry Pratchett's most famous characters will be on hand to aid your quest. Along the way you'll meet Granny Weatherwax, Nanny Ogg and Magrat Garlick, as well as a rich supporting cast of familiar faces from the Discworld series. When things get really tough and you feel you are turning "Black Aliss", you can always have a cup of tea with one of your fellow witches. The Witches can be played competitively, cooperatively, or solo. Designed by Martin Wallace and published by Mayfair Games The Witches is a semi co-operative dice rolling/set collection (it’s not as confusing as it sounds) game in which the players take on the roles of a cadre of Lancre witches as they roam around the region dealing with the usual trials and tribulations of their kind such as sick pigs, deaths and the occasional outbreak of supernatural nastiness! The board is drawn beautifully and shows a birds eye view of the region of Lancre and all of the locations made famous (or infamous in some cases) in the books, from Lancre Castle and Granny Weatherwax’s Cottage to The Place Wher The Sun Does Not Shine and The Long Man (a rock formation in a VERY suggestive shape…. cue close up!) The board itself is great quality and suffers from no warping, ours has had quite a few games and is still box fresh! Tiffany Aching can become invisible, passing through otherwise impassable spaces. Petulia Gristle has the ability to cure one sick pig event free. Annagramma Hawkins has a free use of magic but starts with a cackle token. And Dimity Hubbub always goes first. Each has a coloured border and matches the player pieces which are four coloured wooden witches hats which look really good on the board, I would have preferred some miniatures of the witches themselves to play with but there are companies who make them anyway so they can easily be bought later. The dice are nice even though they are wooden, I’m not a fan of wooden dice, and have 2-6 as usual but the one spot shows the face of a cackling witch. You do not want to roll this in the game too often. The problem tiles, in two colours green and purple, are really well printed, have great little images on them and have a great finish to them as do the cackle tokens, showing a laughing hag and the Crisis Counters with worried villagers. The tokens you never want are the Black Aliss tiles as they decrease your end game score if you have any, and you cannot rid yourself of them. The components are really good, as I said I would have preferred some mini’s for the player pieces but I’m very happy with the rest of the parts. During your turn you start with placing a problem tile. You draw the top card from the deck and place the next tile from the holding area (bottom right of the board) in the location shown on the bottom of the card. If there is already a problem there it gains a crisis token, which increases its difficulty by 2, and you draw a new card to try and place it. Continue until it is placed. Next you move your Witch for the first time. You may move your witch up to two spaces along the paths on the board, or to any space if you use a card with the broomstick image at the top. If you encounter another witch or a problem tile you must stop and take action. If you are on a space with a witch you can stop and ‘Have Tea’ which enables you to discard up to three cackle counters, and your fellow witch(s) up to two. If you are on a problem you have to decide whether to try and deal with it. To deal with a problem first check the difficulty of the problem shown in the bottom right of the tile, then you roll the first two of the four dice. If you roll a witch icon at any time you gain a cackle token unless you can play a reroll card to negate it. If there are no cackle tokens in the pool to take you take one from the player with the most, and if that’s you you have to take a Black Aliss tile which are worth a permanent -1. If after this first roll you are confident that you can take the problem out you now have the chance to play any modifier cards, either for the effect in the text box or the icon on the top and roll the second set of dice. If you succeed you claim the tile and add it to your player board where every two of each colour provide a bonus (+1 hand size for two green and +1 to rolls for two purple) if you fail you have to retreat to the next space on the path and taking a cackle counter, if the space is not empty you take another cackle counter and continue in this fashion until you are alone on a space. The purple tiles, which remain face down until encountered, are the hardest problems and feature some of the supernatural elements the witches face and some have extra effects if you fail them such as forcing you to take Black Aliss tiles or even for the game to automatically end and the witches to lose if you have three or more elves face up. You then refill your hand to the maximum, starting at three cards and then adding one for each green pair you have up to a maximum of seven. Once all of the problem tiles are out of the holding area the game ends and the scores are counted, shown in the lower left of the tiles you have collected, and the witch with the highest score wins. But there are two ways that the board can win. As mentioned before, if there are three or more elves face up on the board, you lose also if you have to place a crisis counter and there are none to place you lose, meaning taking care of the problems made harder by crisis tiles is important as is not revealing too many hard problems unless you are confident you can defeat them. The game has a semi co-op play style to it as you need to work together in a sense to stop the board from winning, but you are all competing to be the best witch so you find yourself swooping in and nabbing a couple of the easy tiles your opponents are headed for just to bolster your hand for later. The game is a brilliant, simple to learn and teach game for most ages, the guideline says 13+ but the only thing I can see that would be unsuitable for younger people is the ‘Long Man’ on the board being a tad suggestive. I will give The Witches 8/10, if there were mini’s I would give it a nine, it is SO close to being my perfect idea of a quick, fun game and I would ask any player to give it some consideration. This game is so similar with The Witcher Adventure Board Game (yes the game from the video game), but a lot simpler and less gamey. This game is part of the Discworld series by Martin Wallace and an adaptation of one of it’s novel (focusing on the Witches character and storyline). In the game, players will be playing as witches that will roaming the land from one place to another trying to solve everyday issues, from sick pig or death. By solving problems, they acquire points, player with the highest point at the end wins the game. But, there’s a possibility that the game ends by a specific conditions which all players lose. The game is simple, each turn a player will have 2 movement action. When they move to a location with a problem they must stop and try to solve it. Or they can grab a tea if they encounter another witch. Each encounter has difficulty number and the player need to roll his dice to at least equal or beat the numbers to successfully solve the problem. Players can also play cards to help with their rolls. That’s pretty similar like The Witcher, which also moving around places and trying to complete quests (also dice rolling). But The Witcher has boyish heroic adventure theme (which appeals more to boys) and RPG elements with deck of cards and complexity of dice rolling manipulation. It is simple and very entertaining if you’re into Terry Pratchett’s joke and characters. The game is mainly for children or family, very casual and easy to learn. After a while you can feel it to be quite repetitive. If you like Discworld and simple game, this could be a good choice. Contents: 1 game board, 55 cards, 80 counters, 4 trainee witch displays, 4 wooden hats, 4 custom dice, 1 player aid and a rulebook. So please pardon the roughness I as did not use my professional production team. They aren’t cheap! I have also included a written review below. The Witches by Martin Wallace and published by Mayfair Games based on the Discworld series of books by acclaimed author Terry Pratchett. That being said, there was a lot of people salivating for this game for the Pratchett fans of Discworld and of course in anticipation of a Martin Wallace game as he is an extremely well know board game designer. So was it worth the anticipation? Well I’ll be first to say I was a little surprised at how simple the game was. It has its “Wallace” type moments but for the most part this is a gateway game and is very easy to learn, teach and play in 20 minutes or less. The Witches is co-operative but with limited interaction. The players get to pick one of four trainee witches from the Discworld novels, each with a special one time use power and travel around solving problems such as a sick pig, death or an invasion of Elves. The object of the game is to have the most victory points at the end based on problems the player has solved. So while the players are out trying to prevent to many problems from happening, so as to not trigger the end of the game early, they are also competing for the most victory points at the same time. There really isn’t much to game rules wise so I’ll skip that part for this review and just focus on playability. The Witches is a bit deeper than one would think based on it’s simplicity yet still very easy to teach anyone including kids. My 11 year old daughter had no issues with learning this game and playing it well. It’s simplicity and being fairly quick to play making it great for game night with non-gamer friends or family game nights for those that don’t wan’t anything to heavy. I know some parents might balk at a “witch” theme but there is nothing hear to offend or worry about either. The Witches is a solid, simple game that most should enjoy enough to purchase especially if you are looking for good games to play with kids. This will certainly fill the bill. I know how kids like to be distracted while playing board games and this one will allow for that a bit. I am giving The Witches 7 out 10 stars based on how easy to learn, teach and streamlined it is. 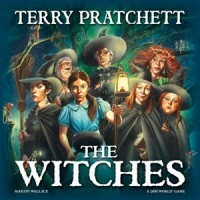 Add a Review for "The Witches: A Discworld Game"